Before I begin, let me say that unlike other big names in the media that were discussing the topic on Friday (such as Jack Welch) I do not believe there was some conspiracy on Friday to make the unemployment rate better for Obama's re-election. The way unemployment is calculated was changed in 1994. It has been rigged ever since that point. This did not change on Friday, it has been this way for a long time for anyone who has been paying attention (and reading this site). I'll also note that the most important event leading up to this election is not the jobs number on Friday, the debates taking place now, the amount of taxes Romney paid in 2010, or who plans to cut .00005% or .00004% of what is really needed to be cut out of the budget. It was the announcement of QE3 a few weeks ago. By far. The household survey, which is the number used to calculate the unemployment rate, showed an increase of 873,000 jobs. The establishment survey only showed an increase of 114,000 jobs (a very big difference). There have been wide ranging speculations as to why this disparity occurred from college students deciding to get a job in September instead of going to school or the push back in hiring due to the farming drought over the summer. I have no idea what created it. Either way, we are working with 873,000 new jobs. Of this group 582,000 were people who took part time jobs and wanted full time. A former executive at Bank of America who was making $150,000 per year took a 20 hour a week job at McDonald's. 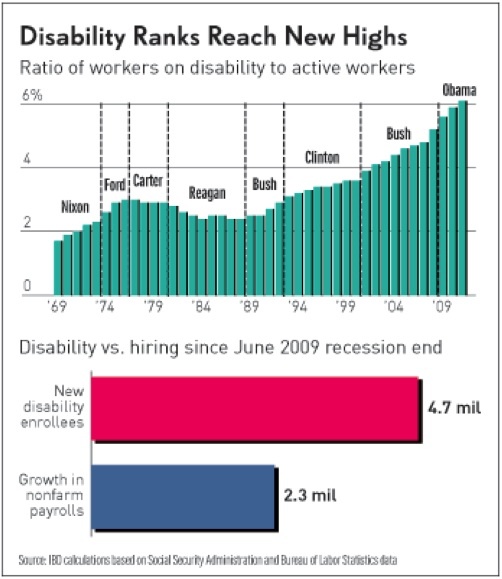 This has been a steady trend since the depression began back in 2007. High paying jobs have been lost to part time low paying service jobs. The government counts these people as employed because they worked at least an hour a week, even though these people still feel very unemployed while they continue to look for real jobs. The following chart provided by Shadow Stats shows the different unemployment rates we will be working through. The first red line is the headline number you see reported by the government and the media. This is a complete farce. The next number, also reported by the government (U-6), adds in the group just discussed (part time workers who cannot find a full time job) and short term discouraged workers (they have been out of work for a short period of time but have given up looking for a job). This U-6 unemployment rate remained at 14.7% this month. We are getting closer to the real data now. The top line adds in one more category; the long term discouraged workers. After workers have been out of work for an extended period of time and want/need a job they are even removed from the U-6 table. Why is this important? The number of long term discouraged during the current depression is enormous. What is the actual unemployment rate when this group is factored in? Just shy of the record reached during the peak of the great depression (25%), and closing in again on the record high reached during the current depression. This is not some pie in the sky number, it is just how the data was calculated before 1994. The real unemployment rate. 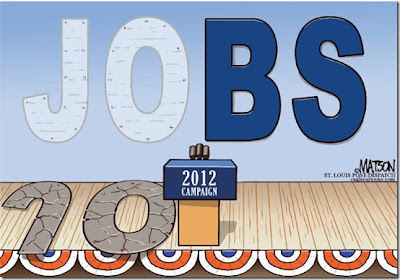 Over the last year 2,867,000 Americans "left" the labor force (they gave up looking for a job). 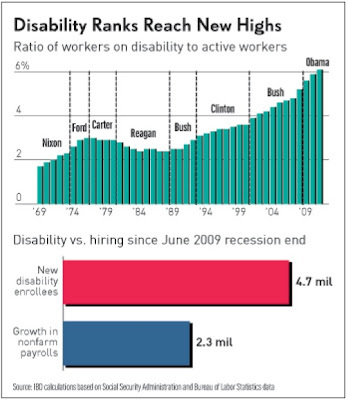 Most are collecting unemployment, food stamps, disability, or all three. The incentive to look has been reduced significantly and when they "give up" it makes the unemployment numbers look much better. The ultimate goal would be to have everyone that is out of work give up looking. Then the unemployment rate would be 0%, keeping the over priced stock market soaring to new highs. Riding the Trillion-Dollar Real Estate Recovery Roller Coaster. There are few people in the financial world today that cause me to completely shut down what I am doing and hang on their every word they have to say. Kyle Bass is one of those people. Most hedge fund managers hope to capitalize on one "black swan" type of event during their career. Kyle has hit the last two in succession out of the park. He was one of the very few who bet heavily against subprime mortgages (making him a household name) and then probably the only member of that small group who immediately took his profits and bet heavily against a small off the radar country back in 2008: Greece. The value of both sets of bonds plunged over 90% making the returns on his leveraged bets almost impossible to calculate. He is interestingly today now back in the US market purchasing subprime real estate credit. Let me briefly explain that buying credit does not mean he is out buying US real estate at face value, he is purchasing deeply discounted mortgages on the secondary market. If he can purchase a tranche of subprime loans for 40% of par value and they end up being worth 60% of par value he once again makes a killing. Where is the next subprime mortgage, Greece-like, black swan he sees today? He sees every potential opportunity in Japan. Again, this does not mean that he is necessarily shorting the Japanese stock market or the Japanese government bond market; he is in the credit markets purchasing insurance against those losses which allows his gains to be magnified. Unfortunately, for the average investor there is not an EFT available that allows you to do this. You have to invest in a fund, such a Hayman Capital that Bass runs, in order to get this exposure. Kyle sees no reasonable discussion ever taking place on the US debt crisis because doing so would make a politician completely un-electable. That simple sentence sums everything you need to know if you decide to spend three full hours hanging onto every word spoken by talking heads of Romney and Obama as they go back and forth over absolutely nothing of meaning. The real change needed will only come with a crisis. Mark Cuban, billionaire owner of the Dallas Mavericks and one of the best business minds in the world today, took some time to speak with CNBC this week. The discussion was regarding high frequency trading, one of the most important and least understood components of the stock market today. The following is part one and two of the discussion where Cuban has the chance to explain that these traders do nothing to fundamentally help the markets. It is only a profit center for trading firms where in many ways they are just stealing from other participants in the market by jumping in front of trades that are placed. If you are looking to understand high frequency trading further, I would strongly recommend reading the incredible book Dark Pools, which was one of the two must read books released this year so far (The New Depression being the other). During the interview Cuban is asked if he sees another flash crash coming (where the DOW fell 1000 points in less than 15 minutes), which was caused directly by high frequency trading. "No," he responds. He sees something coming that will be far, far, worse. Part two of the discussion with Mark where he has a chance to discuss the issues directly with a member of a high frequency trading firm. Silver pessimism over the summer showed investors were selling everything they get their hands on. I was doing everything I could week after week to describe the buying the opportunity taking place in the market. Bloomberg and other mainstream networks, who forgot silver existed back at $27, are now trumpeting the horn that we are once again on our way back to $50. This is the time to hold current positions and wait for the next bout of extreme pessimism. Reader Question: Should I Purchase Hard Assets On Credit? A reader left this comment and question on an article from over the weekend. As I was typing out my response, I realized it might be easier to post it here. First and foremost I want to mention that I've been reading your blog for about a year and very much enjoy your insights. Let me ask you a question, I followed your advise and read James Rickards "Currency Wars". The book was great and led me to make a few conclusions about the current crisis and where we will end up. As you noted on multiple occasions the FED's response is to print and print ad infinitum. The end game of this being a global repudiation of a dollar not just as a reserve currency but the end of fiat systems worldwide. According to conclusion of the book (which I agree with) the FED is daring the world to give up on the dollar - hence unlimited printing. Plan B is already in place with the establishment of a new dollar which will be fully backed by gold. This will be possible due to the fact that approximately 57% of all the gold in the world is housed in US. With the above being the case it seems that the rates will never go down in our current dollars until the system itself is repudiated. If that is so, wouldn't it make sense to borrow as much as possible from the banks to purchase hard assets (real estate, agriculture, commodities)? 1. Global leaders put a plan in place to create a slow and orderly process of returning to the gold standard. He felt an analysis could be done to come up with a gold price that could reflect the amount of printed currency that has entered the system since 1971 (when we left the gold standard globally). This outcome is very unlikely in my opinion. Why? Because it would put limits on the amount of money governments can borrow and spend as well as put restrictions on the banking sector. 2. The gold price will revalue itself in a chaotic and violent fashion upward to reflect the destruction taking place in all fiat currencies around the world. 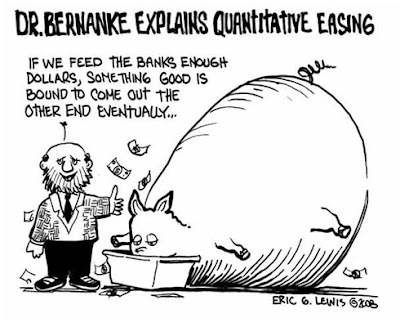 Governments and central banks will act in a reactionary manner (as they always do). You will see gold move upward in a way that seems truly impossible today. This is the most likely outcome I see occurring. It just seems that they will do every thing possible to push back the ultimate day of reckoning to the last possible moment. It is important to understand, based on what you mentioned above, that in either case the United States is in an excellent position due to their gold holdings. It will ultimately be a very sad ending for the foreign countries that have spent the last 40 years working hard to send America goods that we have consumed only to take worthless paper I.O.U.'s. It is almost possible to imagine that with the amount of information available today that this ridiculous process is still taking place. The US, since they took the world off the gold standard in 1971, has kept the gold stored in the vaults on US soil. They have essentially conned the world for over forty years running. It is no different for investors holding their savings in paper assets such as stocks and bonds in a 401k and counting on government support through social security, medicare, or a pension. They have been conned as well believing that governments will always be able to borrow and print worthless paper dollars in the future in order to provide everyone the lifestyle they have been promised forever. To answer your question I want to tread VERY carefully. Let me remind you that I am not a financial advisor and you need to talk to one before making any investment decision, ESPECIALLY one that involves debt. Your question was "should you borrow money to purchase hard assets?" Let me answer that question first using myself as an example. I started a business over the last year. I had the personal capital to fund the entire start up cost of the business. In order to do that, however, I would have had to sell precious metals. Instead, I approached three different credit card companies who offered me a total of $25,000 in credit with 0% interest for 18 months. So I had a decision to make. If I decided to fund the creation of my business through credit, I was essentially betting that the value of gold and silver would be higher in 18 months than it was today. The banks allowed me to make this bet with their money at 0% interest. I chose to borrow the money at 0% interest. My business is now up and running strong and I am paying down this debt with the income generated through the business. What else did this allow me to do? During the summer months when precious metals fell and pessimism was extremely strong throughout the market, I had the opportunity to purchase metals - not sell. The banks were essentially providing me a loan to purchase distressed assets. This type of thinking is the exact opposite of the way most people think. However, it is the way all business owners and large scale investors view debt - as a tool, not something to be afraid of. While I think real estate is still over valued, I plan on using a tremendous amount of borrowed money (leverage) to purchase commercial real estate in the coming years. The debt does not make me afraid, but at the same time I have respect for it. I AM NOT RECOMMENDING THAT SOMEONE ELSE DO WHAT I JUST DESCRIBED. Please re-read the last sentence again. Here is another example, which I think is a more direct answer to your question. What if I was not starting a business and I borrowed $25,000 at 0% interest for 18 months and I used this money to directly purchase precious metals or commodities. This for me is a more dangerous option. In the first example I was investing in a cash flowing asset with the debt (something that every major business owner or real estate investor does across the country). Why is it dangerous? Because silver and gold (or other commodities) can fall in price and take a long time to come back to their previous high level. If someone bought silver at $22 in March of 2008 (I remember the night it hit that level - it was the night Bear Stearns was sold) they had to wait almost two and a half years later for it to hit that level again (then it quickly ran to $50). If you bought on credit, you may have run out of time. The answer to your question is a personal decision based on your financial strength, income, age, the way you handle risk, and how well you can stomach pull backs. Here is one more personal example. Someone I know recently had a child enter college. They were in the fortunate position where they could pay for the entire cost of college through their savings. What was my advice to them? Take out as many student loans as possible. A student loan would provide them with a 4 year deferred loan at 0% interest. Instead of paying for the expense of college with cash they could then invest that money into commodity related assets, many of which provide a dividend paying income stream. Again, this is not something I would recommend to everyone. It was based on their personal financial situation. The point of this discussion is to open your mind to what money actually is, something I will continue to discuss here on a regular basis, and how you can use debt to your advantage. Let's take a quick tour around the global economy through some pretty charts. There is no rhyme or reason here, just a stream of consciousness on all things finance. The median household income growth in the United States since 1999: down 13.3% for the 45 to 54 age bracket (the highest and most important earning years). 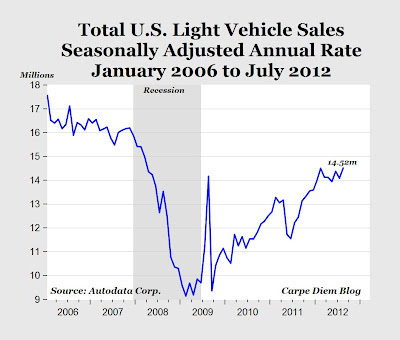 Auto sales in the US are back up to 14.52 million annually. This is still far below the 16 to 18 million sold during the 2005 - 2008 housing bubble boom, but it is much higher than the 10 million annually reached during the peak of the financial crisis. You can see the temporary spike up to 14 million annually for the cash for clunkers program. Subprime lending in the auto sector is back at full strength (providing loans to buyers who cannot pay them back) creating another temporary surge in the sector. The following shows the number of people per country considered part of the ultra wealthy. It shows that America is still home to the majority of people around the world who find themselves in this category. This will shift dramatically when the US reaches its debt crisis and most of these "paper wealthy" will be caught off guard during the global wealth distribution. 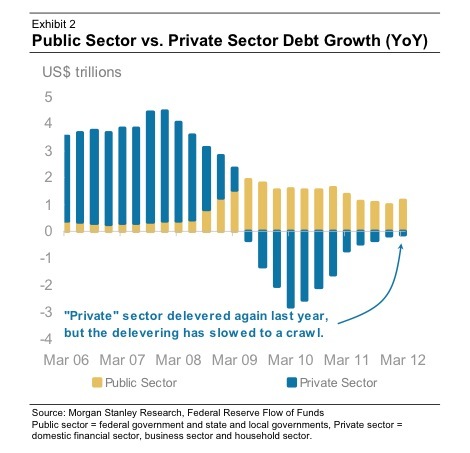 Next up we have the public (government) vs. private sector debt growth. You can see the steady growth of the government (tan line) debt growth through the crisis which many argue has kept us out of another great depression. I argue that we entered the next great depression in December 2007 and the government spending has only masked the rotting under the surface which has not had the ability to heal. The cure will only do more damage to the patient in the long run bringing something worse than what was experienced during the 1930's. The percentage of Americans with less than $100 in savings is incredible. It shows the thin line between current complacency and the social unrest experienced every day on the streets of Spain. See Checking In With Spain. 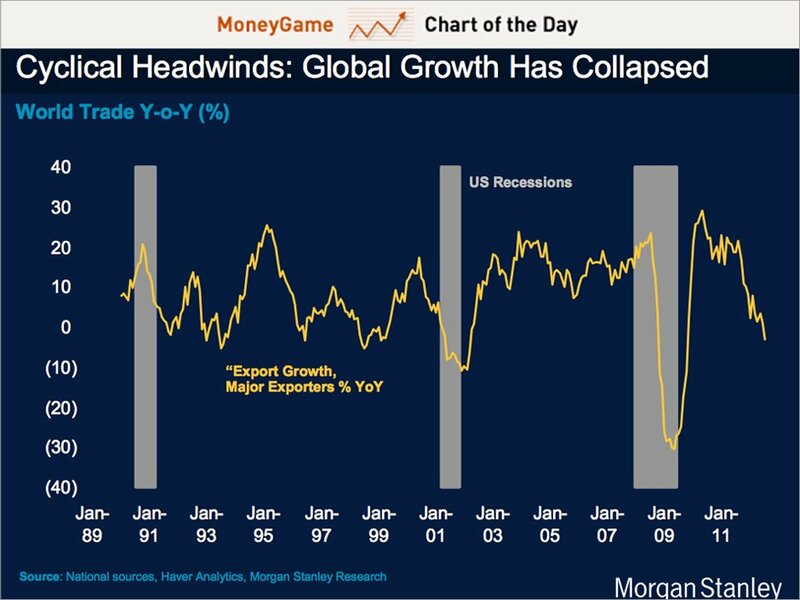 Global growth has collapsed around with world as the following shows the percentage growth in world trade year over year. We have once again moved back into negative territory, which as I discussed in US Stock Market Sentiment & Prices Soar: Shorting Opportunity?, has been completely ignored by the US stock market. 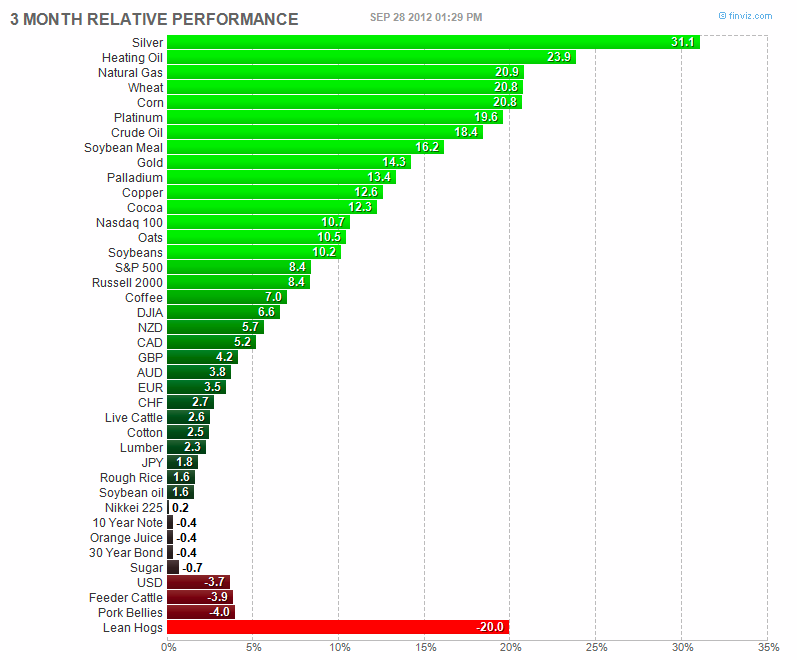 It continues to levitate up into the stratosphere (while other markets around the world continue to fall with reality). The Federal Reserve, since the conclusion of QE2, has stopped buying new treasuries with newly printed money. The interest rates on treasury bonds, for numerous reasons, have continued to fall (bonds rising in price) since the Fed left the market. One of those reasons is the re-emergence of the Asian buyers; Japan and China. Japan, which will soon face a debt crisis of its own and will need to sell foreign debt (US treasuries), has been steadily catching up to China as the second largest holder of US debt in the world (the Fed is first). 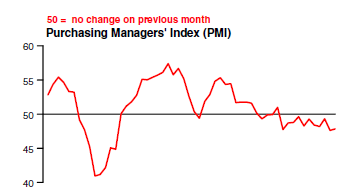 Japan's economy is already contracting, shown in the Japanese manufacturing PMI data below, and it is only a matter of time before their government debt bubble implodes and sends them into the world of pain seen in Spain. As interest rates fell on Spanish debt since the announcement of the ECB's "unlimited purchase plan" in early September there has been very little discussion on the details of actual bailout Spain needs (which is why rates have recently begun rising again). Spain must first ask for a bailout from the Eurozone and the ECB can only work in tandem with the ESM bailout fund to coordinate support. However, before that happens there must be actually money in the bailout fund. The German courts ruled that Germany can only contribute 190 billion euros to the fund which has now put significant pressure on France. The member country requesting the bailout (Spain) obviously cannot be a part of the group that contributes. This means that as of this point it will be up to France to pick up the slack of both Spain (requesting bailout) and Germany (cannot exceed 190 billion euros). Estimates show this slack rising to 226 billion euros or 44% of all tax receipts France takes in per year. Besides the obvious political ramifications, France's own economy is sinking deeper into recession and is rapidly moving toward a depression. The following shows the recent PMI manufacturing data for France (blue line). The GDP (orange line) is reported on a lag, which shows the dire direction the economy is headed. The unemployment situation in France is just as bad. Both manufacturing (blue line) and services (orange) are moving back down to the crisis lows of 2009. The French government, deciding to take a gun to its own head, is now fighting off this recession with massive tax increases which will crush any hope of business growth and hiring (a preview of future US economic policy?). France is just a snapshot of the entire Eurozone's economy which is moving further and further down the black hole due to the spreading government debt crisis. 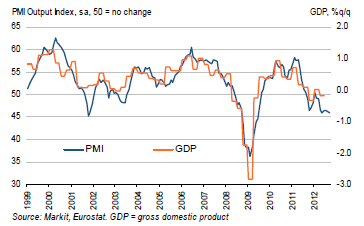 The following shows the Eurozone PMI (blue) with the lagging GDP (orange) which will soon be tracking lower. 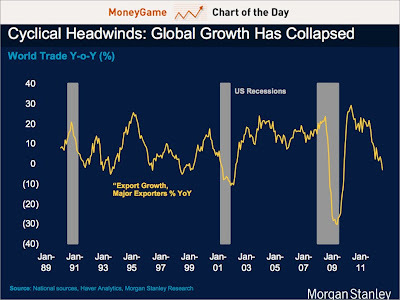 The response to this global slowdown? 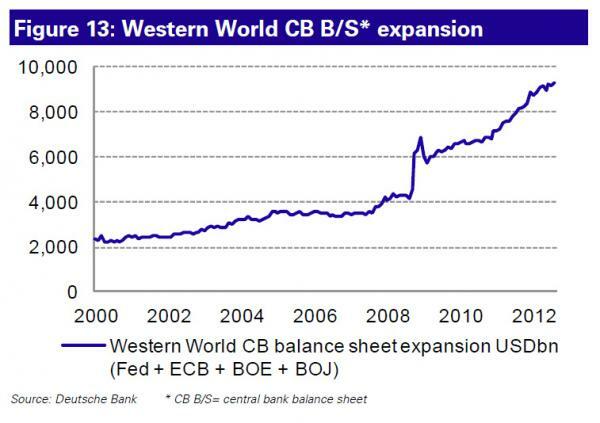 More money printing everywhere in the race to debase currencies and boost manufacturing and trade growth. This is modern warfare fought in the currency markets. 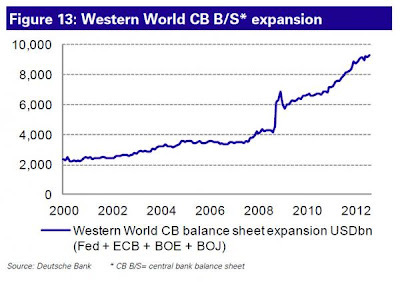 This chart shows the balance sheet growth of the big four central banks: Federal Reserve (America), ECB (Eurozone), Bank of England (the UK), and the Bank of Japan (Japan). The US Department of Education released a report on Friday showing that the percentage of student loan borrowers who defaulted on their loans during the first three years after leaving school reached 13.4%. Borrowers are considered in default when they miss payments for 270 days. The size of the federal student loan market has reached $914 billion. What happens to the 13.4% of borrowers that have left school, found out there are no jobs available, and now have $120 billion of loans in default? They enter debtor's prison because student loans cannot be discharged through bankruptcy. This has become huge business for the collection agencies who were paid $1.4 billion just last year to hunt down these Americans. When found, almost like a scene out of the Hunger Games, they begin the process of wage garnishments and seizing tax refunds. The story is obviously terrible for the defaulted students conned into the American dream higher education and debt enslavement, but what does it mean for the larger economy? The total size of the student loan subprime market is rapidly closing in on $1.3 trillion, which was the size of the total real estate subprime market at its peak in 2007. Some argue that this will have a similar impact that the housing market had on the economy as more and more of these loans continue to default. This will not be the case because the federal government has either insured or back stopped almost 100% of the student loans currently in the system. It a simple write down on the balance sheet of the federal government, running at over $16 trillion in the red as of this writing. While most Americans have not taken the time to look around and take notice, America is now essentially a communist country. Home mortgages, auto-loans, small business, and student loans are now provided or insured by the federal government. Loans provided from the private sector banking system, the too big too fail banks, are also back stopped by the federal government should these loans fail. 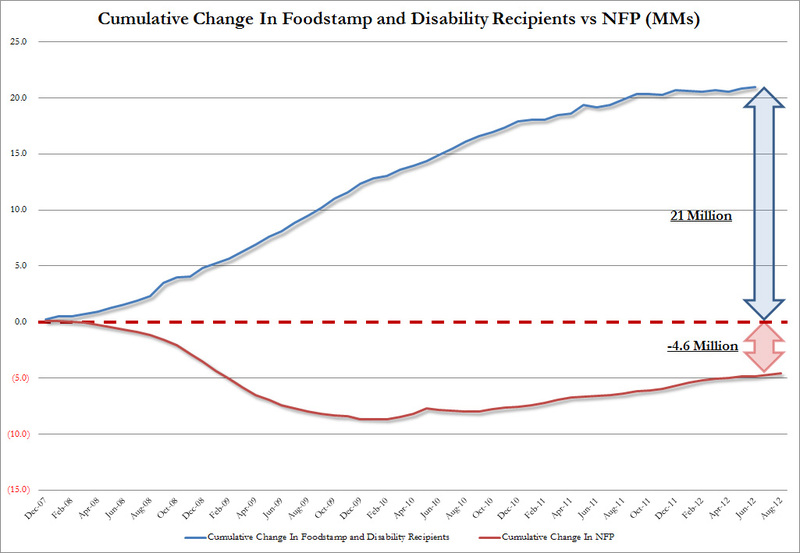 Well over 50% of the country now lives off government assistance through disability, social security, food stamps, etc. 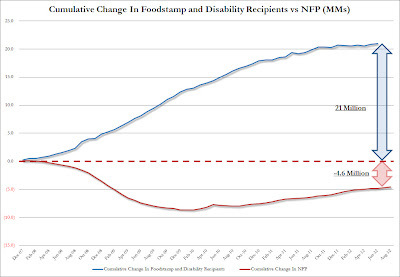 The following chart shows the rise in those receiving disability and food stamps (+21 million) vs. those who have received a job (-1.6 million) since 2007. Why bother going through four years of college and accumulate the debt when you can just leave college and begin receiving a disability check with a food stamp card? How does the coming hundreds of billions in student loan debt defaults impact the big picture? Very little. It is a drop in the bucket for the total disaster that makes up the US government debt bubble. It is just another junk of debt for the federal reserve to print and purchase as we move closer to the day where 100% of the economy is provided though the federal government, which is paid for by the Federal Reserve's printing press. Sound drastic? Think about how different the country of America is today from September 2008. To help put the $120 billion student loan write off in perspective, here is a quick run down of the staggering defense spending in the United States every year.